1. This submission concerns human rights defenders in Burundi between 2013 and 2017. 2. Since 2013, there has been an increasingly hostile environment towards civil society actors in Burundi, affecting in particular human rights defenders and journalists. The crackdown on civil society, which intensified in the lead up to the 2015 elections, heightened the vulnerability of human rights defenders and independent journalists. They have since been more exposed to targeted killings, abductions and violent attacks. Their space in which to operate shrank noticeably as Burundian authorities often equated human rights activism with insurgency while adopting administrative and repressive measures intended to keep civil society work under government control. The increasingly hostile environment for civil society and journalists in Burundi. 4. In 2012, Front Line Defenders produced a joint submission with the East and Horn of Africa Human Rights Defenders Project and Protection International for Burundi’s UPR in 2013. This submission raised as key concerns the deteriorating situation for civil society and journalists, attacks and threats of violence against human rights defenders, judicial and administrative harassment, and restrictions on public freedoms, in particular freedoms of expression, assembly and association. The submission also raised concerns regarding the dominance of the incumbent political party, CNDD FDD, and the absence of free, fair and transparent elections in 2010. Front Line Defenders would like to highlight that these issues still continue to impact human rights defenders and independent journalists in Burundi. 5. Despite accepting 137 of the 176 recommendations made by States during the previous UPR, Burundi rejected the fourteen recommendations related to freedom of expression and association, which directly impact the work of human rights defenders and journalists. Since the previous UPR cycle, the Burundi government has not taken sufficient steps to protect these rights. 6. A key development since the previous UPR cycle was the escalation of violence arising from a political crisis that gripped the country from April 2015 when President Pierre Nkurunziza announced he would run for a third term in clear violation of Burundi’s constitution. The president’s bid for a third term triggered mass protests, particularly in Bujumbura. An attempted coup against President Nkurunziza in May 2015 exacerbated the crisis and led to a crackdown targeting all those accused of supporting the coup, including dozens of human rights defenders and journalists who had been at the forefront of the Bujumbura mass protests. The crisis resulted in the loss of hundreds of lives and displacement of tens of thousands of civilians. 7. Human rights defenders have been subjected to violence, arbitrary detention, attempted killings and enforced disappearances. Those fighting impunity or denouncing acts of corruption and embezzlement involving public authorities are particularly at risk, with a number having been threatened, abducted or killed due to their legitimate human rights work. 8. Marie-Claudette Kwizera, who worked as a treasurer for the prominent human rights NGO Ligue Burundaise des Droits de L'Homme (Ligue Iteka), disappeared in December 2015 and her whereabouts remain unknown to this date. 9. 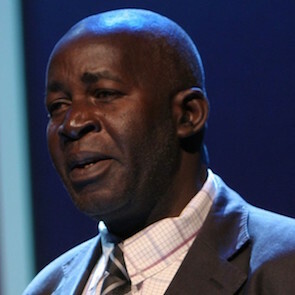 While travelling home from work on the evening of 3 August 2015, Pierre Claver Mbonimpa was shot and seriously wounded in what was believed to be a targeted attack due to his work on human rights. Pierre Claver Mbonimpa is a human rights defender and the President of the Association Burundaise pour la Promotion des Droits Humains et des Personnes Détenues (APRODH) whose work has been recognised internationally through the award of a number of prizes, including the 2007 Martin Ennals Award and the 2011 Henry Dunant Award. In October 2015, unidentified armed persons with rifles and grenades killed Pierre Claver Mbonimpa’s son-in-law, Pascal Nshimirimana. In November 2015, Mbonimpa’s son, Welly Fleury Nzitonda, was murdered after being arrested in Bujumbura. 10. In October 2015, the mutilated body of human rights defender Charlotte Umugwaneza was recovered from a rural street where it had been dumped. Umugwaneza served on the board of OLUCOME, a leading anti-corruption group in Burundi, and chaired the organisation’s committee in charge of preparing the annual celebrations of the “Ernest Manirumva Award” meant to honour personalities who distinguish themselves in the fight against corruption. It was reported that Umugwaneza was kidnapped in a neighbourhood of Bujumbura before being tortured and killed. 11. In February 2016, Ferdinand Manirerekana, a human rights defender who had sought refuge in Kenya and had joined a Nairobi-based group advocating on issues in Burundi (Burundi Solidarity Group), received repeated death threats via text messages to his mobile phone; two Kenyan human rights defenders who took part in the Burundi Solidarity Group’s campaigns received similar threats. 12. The government and its supporters have targeted journalists for reporting on political violence in the country. In April 2015, state authorities forcibly closed the Bujumbura and Ngozi offices of the Radio Publique Africaine (RPA), a private radio station in Burundi known for dealing with human rights-related issues. Four radio stations, RPA, Radio Bonesha FM, Radio Isanganiro, and Radio Télévision Renaissance, were attacked in May 2015 following the attempted coup. These attacks were aimed at reducing criticism of the government in the media and have resulted in dozens of journalists fleeing the country. 13. In late July 2016, Jean Bigirimana, a journalist working for IWACU, the only independent newspaper still publishing news in Burundi, was reported missing. It is believed that Bigirimana was abducted by members of the police and detained in an undisclosed location. To date, his whereabouts remain unknown. Since his abduction, his family has been calling for action on his disappearance. They report having faced serious threats as a result. 15. The law creates exceptions to the rule that journalists need not reveal their sources and also requires journalists to have a university degree regardless of the extent of their experience. This law restricts freedom of the press and journalists’ right to freedom of expression. It also encourages a climate of self-censorship which has had a chilling effect on these freedoms. 16. The National Assembly adopted two bills in December 2016 aimed at restricting the work and independence of national and international NGOs. The second bill, concerning local non profit organisations, stipulates a limit of five years for persons elected to an organisation’s executive committee and does not allow two members of the executive committee to be from the same family. Non profit organisations must obtain authorisation from the Minister of the Interior for any activities, and any funding received from outside Burundi must be transferred through the Central Bank, accompanied by a document detailing the origin and purpose of the funds. The law on non-profit organisations, promulgated on 27 January 2017, imposes registration procedures that are both cumbersome and unrealistic. Under the law, non profit organisations are required to biannually renew their registration certificates. This demonstrates the government’s intention to monitor non-profit organisations and reduce the number of organisations that are critical of government policies or actions. 17. In May 2017, the Council of Ministers adopted a bill amending the Code of Criminal Procedure, authorising searches at night without a warrant, digital searches and seizure of computer data. 18. Since the beginning of the political crisis in 2015, Burundian authorities have resorted to draconian measures to halt the monitoring of human rights violations in the country, including the freezing of assets belonging to NGOs or individual human rights defenders; as well as the suspension and dissolution of a number of human rights organisations. 19. In November 2015, up to 10 NGOs were subjected to measures of temporary suspension of activities in connection with a reported ongoing investigation into their alleged role in “incitement to violence” since the beginning of the crisis in April 2015. 21. The Minister also issued a permanent termination of five other human rights organisations whose leaders were suspected of leading a civil society campaign in April 2015 against President Nkurunziza’s third term, including APRODH, which is led by Pierre Claver Mbonimpa. This trend is concerning as it contributes to reducing the space for civil society by attempting to intimidate organisations and prevent them from carrying out their activities in defence of human rights. 22. As stated previously in this submission, human rights defenders are at risk of physical attack due to their legitimate work highlighting human rights concerns in Burundi. The overall power of one party, CNDD-FND, has left the country without an effective opposition required for a functioning democracy, which impedes the ability of human rights defenders and journalists to voice concerns about human rights violations. The government has created an increasingly hostile environment where human rights defenders fear for their personal safety, and are forced to work underground with an increased need for security. 23. The government has also used administrative measures against human rights defenders. For example, a document issued jointly by the Ministry of Justice and the General Prosecutor's Office in December 2015 informed Radio Publique Africaine (RPA), Ligue Burundaise des Droits de L'Homme (Ligue Iteka), Syndicat des Travailleurs de l'Enseignement du Burundi (STEB) and l’Association pour la Recherche sur l’Environnement, la Démocratie et les Droits de l’Homme au Burundi (AREDDHO) that their bank accounts had been frozen and private bank information was disclosed to the government. 24. The repression of dissenting voices is contributing to a culture of impunity where the government and its supporters are not held accountable for human rights abuses. 25. Front Line Defenders is aware of dozens of human rights defenders who have been forced to flee the country following the unrest in 2015, with many still remaining in exile. A number of these defenders reported receiving death threats prior to leaving the country. For example, the leaders of FORSC, ACAT-BURUNDI and FOCODE, three of the organisations that played a key role in organising the mass protests in Bujumbura, went into hiding for a period of time before fleeing the country, citing credible information of unidentified people searching for them. Even in exile, a number of human rights defenders continued to report threats, which they believed were as a result of their status as human rights defenders. In August 2016, Leon Ntakiyiruta, a member of APRODH, was attacked and severely wounded by unidentified men wielding machetes near the refugee camp of Nakivale, in Uganda, where he had sought refuge. The hostile environment for human rights defenders in Burundi ensures that those living in exile would be at risk if they were to return to their home country. This adds to the restrictions targeting civil society as these defenders are unable to contribute to the promotion of human rights from within Burundi. Take all necessary measures to independently investigate the murder of human rights defender Charlotte Umugwaneza, the attempted murder of Pierre Claver Mbonimpa, as well as the killing of his son and son-in-law, and promptly bring the perpetrators to justice.